In the year or so since the last Strokes recording, 2016’s Future Present Past EP, four of the band’s five members have released records, in one guise or another. Bassist Nikolai Fraiture and guitarist Nick Valensi both formed bands, fronted them and released debut albums within months of each other that each, in their own way, sounded like the Cars. 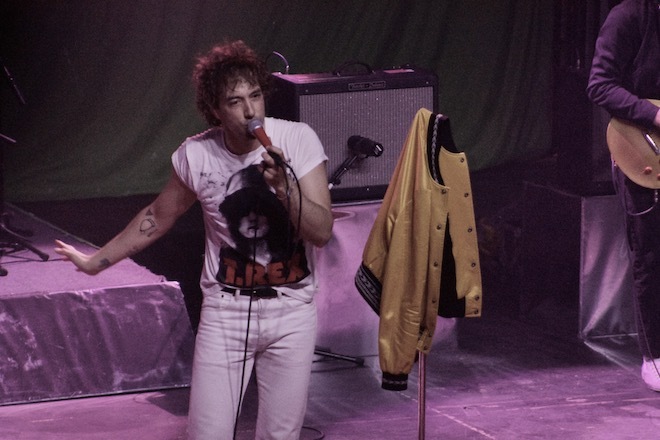 More recently, last weekend, actual frontman Julian Casablancas released the second album of his Voidz alterego, which he has immersed himself further behind: the band’s latest is their first without Casablancas’s name glittering on the cover. The most visible member of his somewhat erstwhile band, Casablancas’s career outside of it is fueled by resentment. Of pop radio for never giving his band a bona fide hit, of hipsters for eventually dismissing riff-rock as less interesting than Animal Collective. Consequentially, it is mostly (more or less) pointless and unlistenable as music. 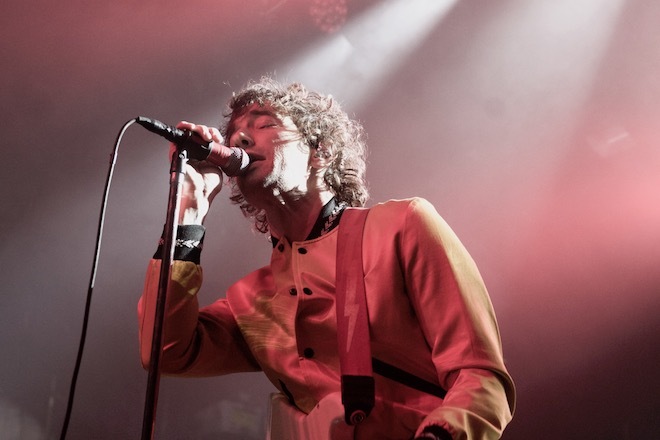 This leaves Albert Hammond Jr., the band’s sometime rhythm and current lead guitarist, whose latest solo release came out earlier last month. He is the best Stroke, the most energetic Stroke and the only member of his erstwhile band who remembers why rock music is a fun thing that kids listen to when they’re angry in high school. He still, for instance, has the moves. On the stage, his feet clasp together and jump in Bruce Springsteen-worthy leaps, his arms generate Pete Townshend-worthy windmills. He wears a gold jacket that, from a certain distance, recalls the outfit donned by Ryan Gosling in the movie Drive. He takes it off and reveals Marc Bolan on the cover of The Slider. Like Bolan’s ruthlessly listenable opus, Hammond’s Francis Trouble opens instantly hits glam-garage perfection, angelic birdsongs written in pure rock epiphany. By the second or third track, Hammond has written an alternative history for himself: if he never left California and was sharing bills with Ty Segal and King Khan & BBQ Show. It will come as little surprise that the record, his first on Red Bull Records and also his fourth overall, is dedicated and themed around a lost twin who died in a miscarriage named Francis and who Hammond has made into an active alter-ego. “He’s everything you’d want to be,” Hammond described the figure to V magazine. Hammond wants to be someone else. Don’t we all? This has been a substantial endeavor for him, he was the first of his peers to go solo and the arc of that career has represented determined pursuit to create a certain kind of sound, riffs arranged in perfect and hard-hitting harmony. This project began in 2006, around the time the Strokes had given up, with the release of Yours to Keep, a record that saw Hammond urgently recycling his band’s creative remains and first half of his life. 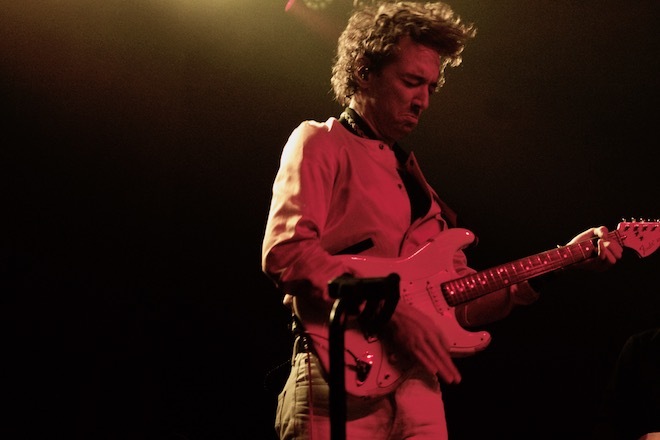 The record’s most memorable song was “In Transit,” a song he still performs—the night I saw him, he did it while members of the Marías, the evening’s openers, danced euphorically around him; at an earlier engagement, he did the same with Spanish indie rockers Hinds. Originally a Strokes demo called “Obstinate”– appearing in the Strokes documentary In Transit—Hammond replaces Casablancas’s angry whining with John Lennon-esque poptastic purr. While his band was literally drowning in filth, Hammond was brushing the dust between chords and giving a second life to his band’s vision of a perfect modern world made of leather. Francis Trouble follows Momentary Masters, a record that followed the debut of mark II of the Strokes, a clustered new wave project created digitally over long distances. Next to this, what Hammond was creating was classic rock. Lennon had now become McCartney, voice smoothed to pop perfection over guitar solos that sprinkled over well-manicured lawns. The relative “grit” on his latest effort, sudden sax solo on “Tea for Two,” the Thin Lizzy riffs of hard rock that begin and end the record is countered by the stunning intimacy of Hammond’s voice. Midway through the record, it breaks to the surface and cracks. “Hold on, hold on, hold on” he chants. Back on stage, Hammond is bombastic. His enters grinning like a schoolboy and the emotional highs and lows of Francis Trouble are sketched in broad emotional paint. The boyishness feels very literal and true. The music is uncynical and strives, like the Strokes once did, to make the people listening to it happy. Oh, to be a happy boy!